Orange Blossom Water Turns Two! My Blog turns two years old today! Happy Birthday Orange Blossom Water! This entry was posted on Monday, February 28th, 2011 at 5:30 PM	and is filed under Celebrations and Occasions. You can follow any responses to this entry through the RSS 2.0 feed. You can skip to the end and leave a response. Pinging is currently not allowed. Happy Birthday Dimah! Have missed reading your posts and gazing at your beautiful photos. Hoping to see more soon! Happy bloganniversary and many more to come! Two years! Congratulations, Dimah. You do such a great job–and I’ve been missing you. Your photos always are so clean and pretty–and very feminine. Lovely. Happy Birthday Orange Blossom Water. may you have many many more! Happy Birthday, Orange Blossom Water. The cupcakes are beautiful and fitting for a birthday party! Keep up the beautiful posts and pics. Congratulations on 2 years of delicious recipes! Happy birthday to your little baby Dimah! To many more years of beautiful posts! Congratulations and happy blog birthday!!! Congratulations! Looking forward to more yummy post from you…. Congrats dear..wish you many many more such beautiful milestones to come..keep up the great work! Dimah, I can’t believe I’ve only just discovered your blog as it turns 2 years old. But I looked through it and you’re recipes are great, so I’ll be coming back often! Many congrats on your blog anniversary! Happy Blogbirthday! I’m looking forward to seeing what you have in store for the next year! Congrats Dimah.Thats a big milestone.Wish you a lot many to come. 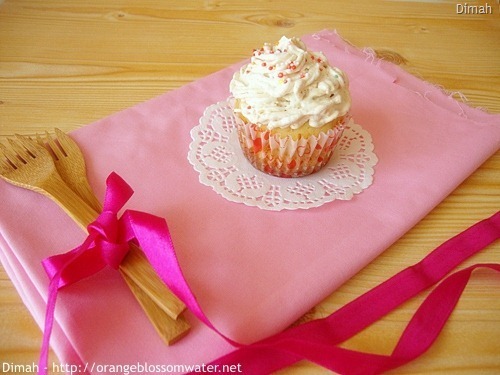 Happy Bloganniversary and welcome back, dear Mrs Orange Water! cup cake looks so yummy!! Happy Blogoversary! Mabrouk on 2 years of sharing beautiful and delicious food! Looking forward to many more from you Dimah! Congratulations, Dimah dear and Happy Blogaversary to you! I just thought of you a few minutes ago and then you appearred in my comment box. Wow, what a day! :o) Glad to hear from you. Yes, time just flies so quickly. Isn’t it? Looking for more adventurous & traditional cooking from you. Hope you’re having a terrific day. Hi! First time here and loved going through ur space. Congrats!!! The cupcake looks beautiful. Happy Bloggiversary and to many more! Happy blog anniversary Dimah, wishing many more to come. Congratulations :-) Keep us the great work ! What a great accomplishment! Happy Birthday darling and wish you many more years to celebrate with everyone. Happy 2nd blog birthday Dimah! Wishing you another great year! Happy birthday to your beautiful blog, I’m looking forward to all the wonderful recipes you make this following year! Hi, first time here.. u’ve a wonderful collection of recipes.. congrats on ur 2nd blog anniversary..!! Wish you more years of blogging! Congrats on the milestone! Looking forward to many, many more posts from you. Happy Birthday! You earned that cake! Mabrouk! Wish you and your blog all the best! Happy blogiversary to you and your exquisite blog! Hapy birthday . . . always love your posts, the recipes, the pictures, all! Boulder Locavore: Thank you so much! you are so sweet! OysterCulture: Thanks for stopping by! Becky: Thanks for stopping by! Emma @ sunflower days: Thanks! Indonesian in Turkey: Thank you! Junia @ Mis Pensamientos: Thank you! Lorraine @ Not Quite Nigella: Thanks! The Mistress of Spices: Thanks! suchitra: Thank you so much! Malar Gandhi: Thank you so much for the lovely comment! héni: Thank you very much! kristy: Thanks for stopping by and for the kind comment! Sanjeeta kk: Thanks for the kind comment! Zara: Thanks for the lovely comment! leaf (the indolent cook): Thank you! Heavenly Housewife: Thank you so much! All That I’m Eating: Thanks! Hannah: Thank you very much! Claudia: Thank you very much! A little bit of everything: Thanks! Sprigs of Rosemary: Thank you so much! Dimah, A very happy blog anniversary! Looking forward to many more beautiful recipe posts. Congratulations on your 2nd blog anniversary.Looking forward to many years more, Insha Allah! Keep up the great work! I know im late to greet but i still congratulate you,,belated happy anniversary to your blog..more power! Happy anniversary to your blog!! !